The previous imperial capital before Sensuka, Okrona, had been built around a grand central square. The square’s vast size made it a fitting setting for the celebration of imperial triumphs, and also provided sufficient space for the imperial dragoons to gather up speed when charging unruly mobs. For indeed, the major downside of having such a large open space in the heart of the downtown was that it provided a natural rallying point for the occasional popular uprisings that are an inevitable inconvenience of big-city living. When laying out Sensuka, the Emperor Bulodi I wisely decided that, to avoid this problem in his new capital, the centre of the city should include not one main square, but two, located in close proximity to one another. In this way, the Most Exalted One saw clearly, it would be very difficult for urban malcontents to focalize their disruptive actions. For it would always be unclear to the starved labourers or student idealists gathering in one square what exactly was going on at the same time in the other: A counter rally? A massive assembly of dragoons? Or, perhaps worst of all, could it be that their fellow citizens were going about their day as usual, in total indifference to their cause? Moreover, in accordance with a natural human disposition, there would always be a tendency for the crowd of protesters to suspect that the really decisive action at that moment was taking place in the square they were not presently in. 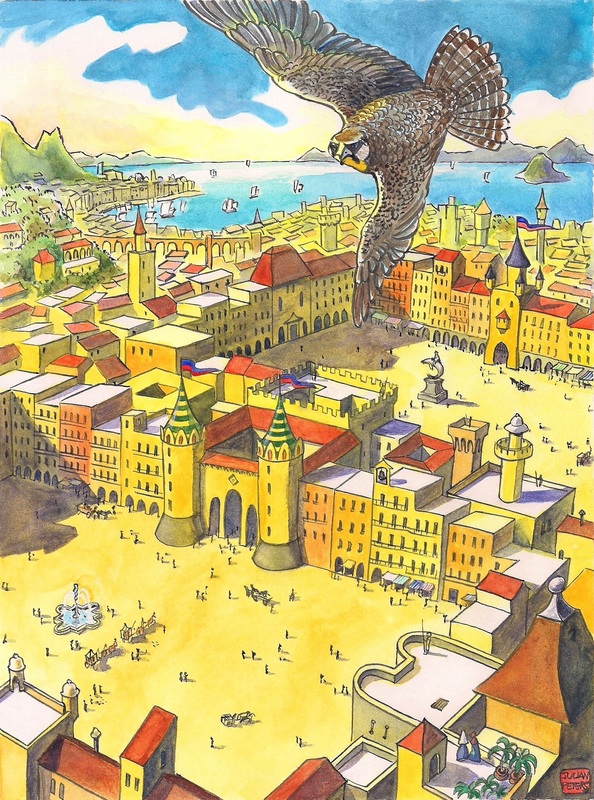 This entry was posted in illustration, Imaginary City and tagged sehnsucht, sensuka, two main squares. Bookmark the permalink. Brilliant! The detail is superb… the colouring sublime – so Mediterrane! I just hope I’m not aiming at clouds! Aim high, brother! And sorry for the repetitive second message. I didn’t think the first one was sent. In the tradition of Calvino’s “Invisible Cities”, we may have to add as its graphic counterpart, Peters’ “Imaginary Cities”. To Calvino’s “Invisible Cities”, we may have to add in due time Peters’ “Imaginary Cities”.